When most people imagine islands, their first thoughts drift to sun, sand and surf. Biodiversity is not often what comes to mind. But islands are places of amazing biodiversity, home to numerous endemic species – those found nowhere else on Earth. Although islands only account for about a sixth of the world's total area, approximately 20 percent of all bird, reptile and plants species are thought to be found on islands. And more than half of the world's marine biodiversity is found in the waters surrounding islands, including coral reefs, sea turtles, whales and many other threatened species. Islands also provide important habitat for migratory bird species, some of which breed on only a single island. This year's International Day for Biological Diversity (May 22) celebrates the importance of island biodiversity. Below are some of the irreplaceable endemic species found in island biodiversity hotspots around the world. The most iconic mammals of Madagascar are the lemurs, represented by five families of primates unique to this island. With 72 kinds of lemurs (species and subspecies), representing 15 genera, Madagascar and the Indian Ocean Islands biodiversity hotspot is the world leader in primate endemism and the highest priority for the conservation of primates. The Critically Endangered black-and-white ruffed lemur is just one of the many endemic species in this hotspot that is threatened by habitat loss due to logging, agriculture, mining and other development. Two percent of all species occur in the Caribbean Islands biodiversity hotspot, but unfortunately more than 700 species are endangered. 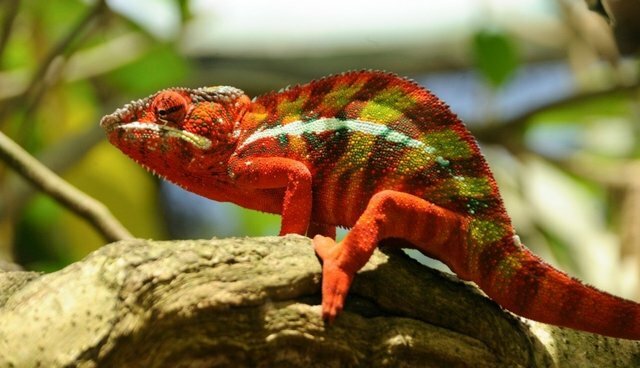 In addition to 13,000 plant species, the hotspot is particularly rich in reptiles, with more than 500 reptile species, almost 470 (or 94 percent) of which are endemic. This includes nine species of rock iguana from the genus Cyclura, all threatened, including the Critically Endangered Ricord's iguana. Although the Polynesia-Micronesia biodiversity hotspot is one of the smallest (its land area is roughly equivalent to Switzerland's), the hotspot encompasses 4,500 islands with extremely high levels of endemism due to its wide geographic range and isolation. The hotspot has close to 300 bird species, with 58 percent found nowhere else. One example is the Endangered Rimatara lorikeet, just one of many species threatened by invasive species introduced during colonization. Twenty-five bird species have gone extinct here since colonization. The East Melanesian Islands biodiversity hotspot covers nearly 100,000 square kilometers and is comprised of 1,600 islands. Because most of these islands have never had contact with other land masses, each one hosts species that are found nowhere else. This is especially true for the hotspot's amphibians, of which more than 90 percent are endemic. This includes the Solomon Island eyelash frog (Ceratobatrachus guentheri), found only on the Solomon Islands and on Papua New Guinea's Bougainville and Buka islands. The Philippines biodiversity hotspot includes more than 7,000 islands, with the larger islands holding more unique species than most countries, and even small islands supporting greater natural wealth than the biologically richest countries in Europe. The largest of the mammals in the Philippines is the Critically Endangered tamaraw, a dwarf water buffalo that lives only on Mindoro Island. A century ago the population numbered 10,000 individuals; today only a few hundred animals exist in the wild. Most island species are at great risk: around half of all animal extinctions in the past 400 years have occurred on islands. Small population numbers, habitat destruction, climate change and invasive species are a few of the main drivers of island extinctions. But there is hope. Conservation efforts are achieving results on many islands. For example, the Critically Endangered Antiguan racer (Alsophis antiguae) – a small non-venomous snake endemic to Antigua and Barbuda – was once believed to be extinct, but was rediscovered in 1989 on Great Bird Island in Antigua. The Critical Ecosystem Partnership Fund (CEPF) has supported civil society organizations in the Caribbean Islands biodiversity hotspot to help eradicate invasive species and the population of Antiguan racers is increasing. This is just one of many positive conservation outcomes on islands. CEPF, its grantees and partners, as well as other environmental organizations around the world, are working to protect island biodiversity, the heart of these paradises on Earth.